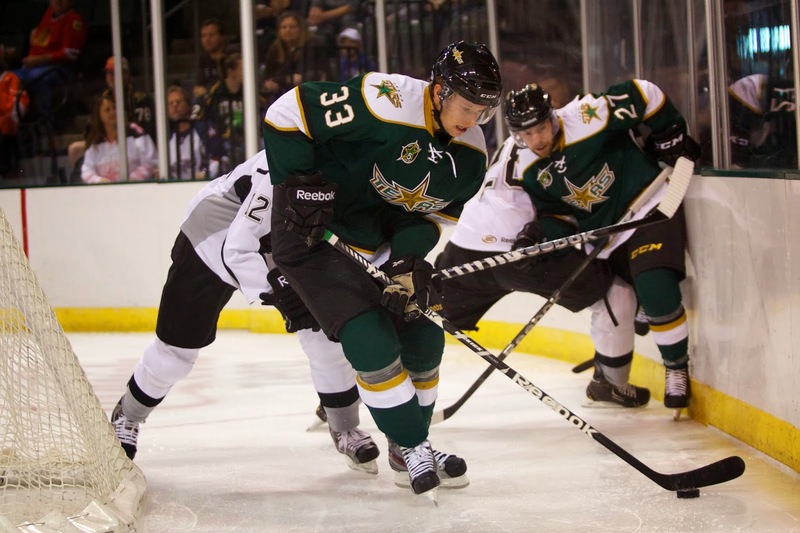 Icing a mostly young lineup, the Stars defeated the San Antonio Rampage by a score of 3-0 in the final preseason game of their schedule. Youngsters Josh Robinson and Pat Nagle split time in net and put together a combined 30 shot shutout effort. 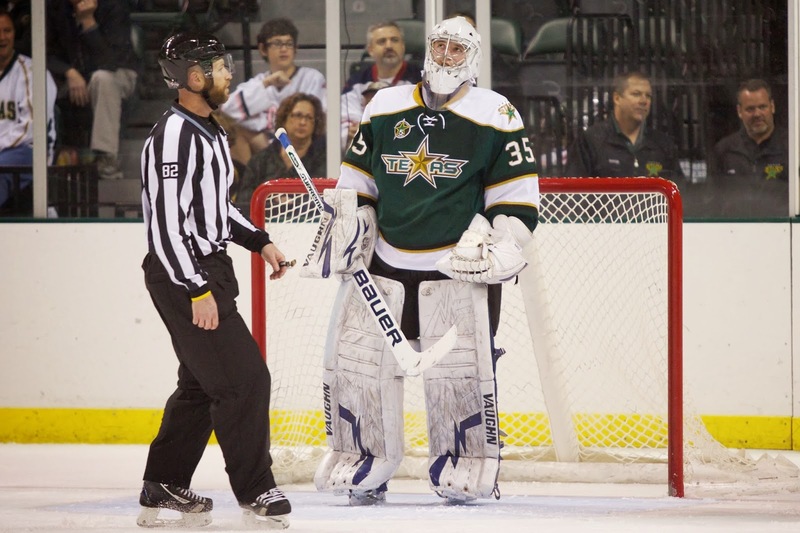 "It was a close game tonight, and the score didn't indicate the play," said Texas Stars head coach Willie Desjardins. "Training camp is to evaluate, and we have to see where these guys are at. It was a great time for younger guys to play and us to evaluate." Despite goals from Austin Smith and Justin Mercier, Brock Montgomery was probably the star of the night among skaters. The young winger had two fights and scored an empty netter. In between, he hit everything that moved, perhaps sensing an opening with the loss of physical winger Luke Gazdic earlier in the day. "We'll miss Luke in a lot of ways," said Desjardins postgame. "He was a really good player for the organization. Not just physicality, but his character as well." Josh Robinson started the night and only saw nine shots before giving way to Pat Nagle halfway through the game. Nagle stopped all 21 against him after coming in cold midgame. "It was great to get in the game and get some shots," said Nagle. "Josh set a high standard for me coming in. Fortunately, I got hit with a shot in the chest right when I came in, and it got rid of the jitters." 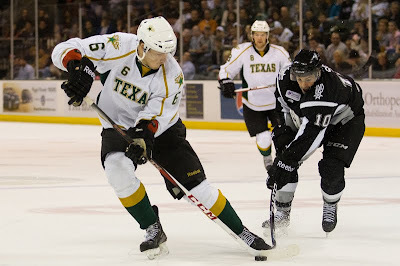 San Antonio and Texas played to a scoreless tie in the first period with the Stars outshooting the Rampage 7-6. The tight shooting game saw Vincent Trocheck lead all shooters with two as last year's OHL MVP and top point scorer. 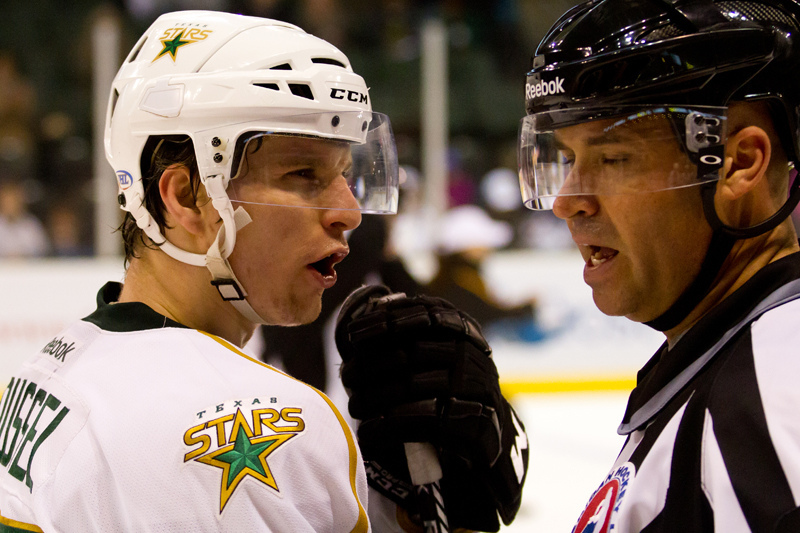 Brock Montgomery got into the fighting game a bit, squaring off with Zach Miskovic. The second period was a little bit more open. Austin Smith potted the first goal of the night at the 6:31 mark, tapping the puck in as it had settled behind Houser in the San Antonio crease. Ranford's initial shot off the right wing side behind the goal line squeaked through Michael Houser where Austin Smith found it. Jyrki Jokipakka picked up the second assist. "Smith's play has improved over last year," noted Desjardins. "He's stronger and skating harder." 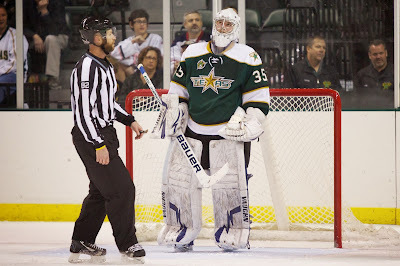 The night's starter, Josh Robinson, stopped all nine shots against in the 28 minutes and change that he played. 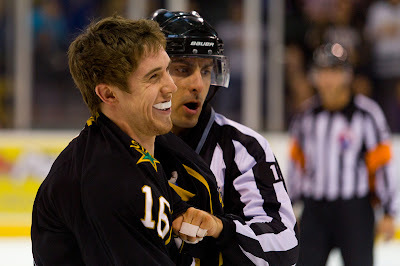 Pat Nagle got into the game thereafter and near immediately faced some intense challenges from the Rampage. A shorthanded 2-on-0 was one of the shots among the nine he faced in the second period. 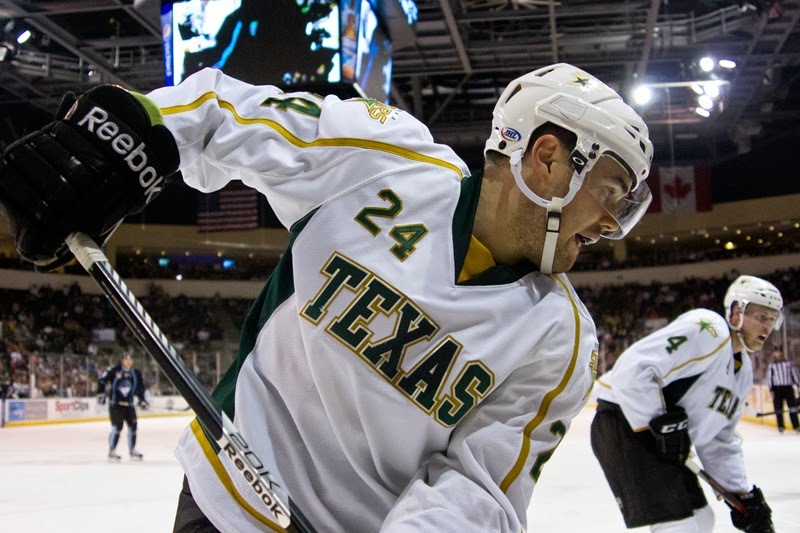 In the third, Texas extended its lead with Justin Mercier's first preseason goal. Jyrki Jokipakka again generated the goal with a solid shot from the left point that Mercier tipped past Houser. 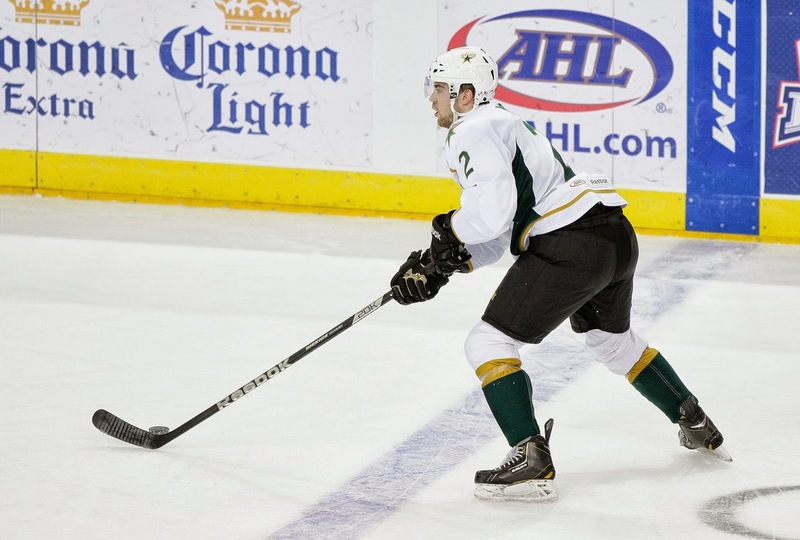 Curtis McKenzie collected the second assist. The rest of the period was rather physical as Brock Montgomery stepped up his game, stapling Greg Zanon and Zach Miskovic on the same forecheck. Vincent Trocheck stepped up to challenge Montgomery and the result was a bloody hand and face for Trocheck. Montgomery was rewarded for his pugilism late in the game as the Rampage pulled their tender for the extra man. 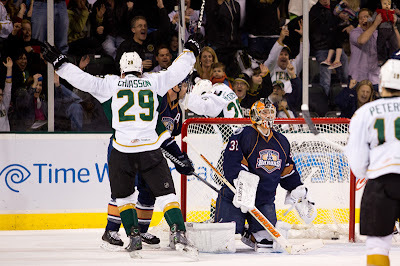 Finding the empty net, he polished off the Stars 3-0 win with seven seconds left. The Texas Stars had Toby Petersen with the captain's "C" and William Wrenn and Cameron Gaunce with alternate "A"s.
The Texas Stars fifth season will be missing a key component as Luke Gazdic has been claimed off waivers by the Edmonton Oilers. Gazdic will report to the NHL and could be playing against the Dallas Stars very soon. The Oilers had a chance to see Gazdic up close on Friday, as he scored a goal in the Stars' 4-0 victory over Edmonton in OKC. Everyone else placed on waivers yesterday for Dallas cleared. More information as we know it. 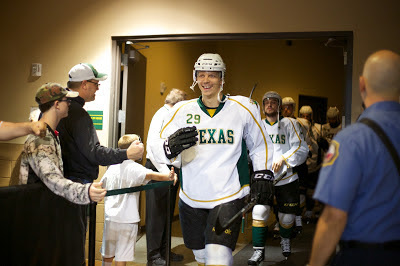 Dallas has announced today that defensemen Jyrki Jokipakka, Patrik Nemeth and Jamie Oleksiak and forwards Brett Ritchie, Austin Smith and Matej Stransky have been assigned to the Texas Stars following this conclusion of the NHL preseason. Texas Stars captain Maxime Fortunus was also released from his tryout contract with Dallas and will report to Texas. Expect these players in camp tomorrow and that some of them could figure into the lineup for the second preseason game. 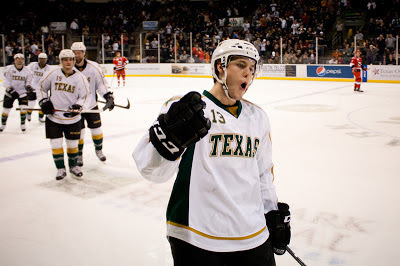 The Texas Stars, proud American Hockey League affiliate of the Dallas Stars, announced today that Dallas has reduced its training camp roster by seven players, all of whom will report to Texas. Dallas assigned six players to Texas: defensemen Jyrki Jokipakka, Patrik Nemeth and Jamie Oleksiak and forwards Brett Ritchie, Austin Smith and Matej Stransky. Dallas also released defenseman Maxime Fortunus from his professional tryout contract. 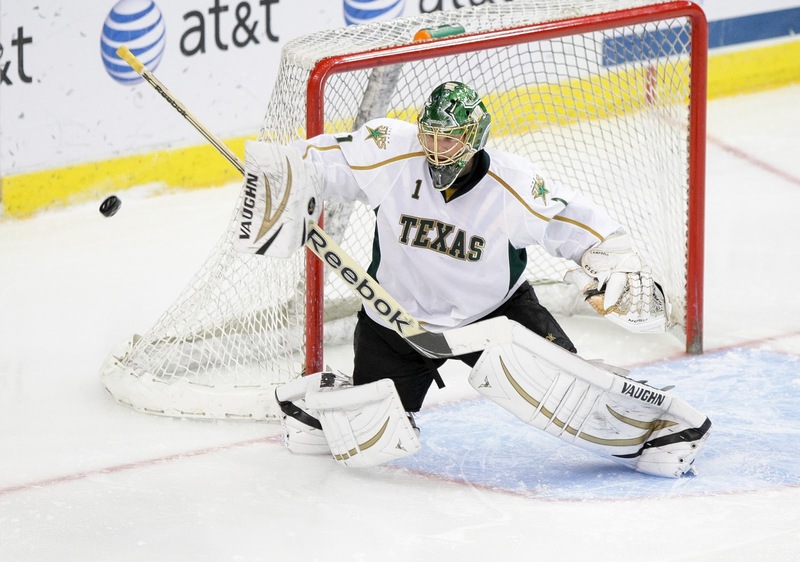 Texas’ training camp roster now stands at 30 players, including three goaltenders, 11 defensemen and 16 forwards. 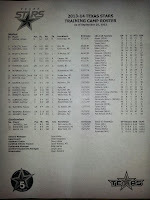 Dallas’ training camp roster now stands at 29 players, including three goaltenders, eight defensemen and 18 forwards. 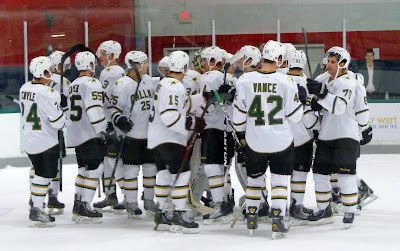 Some of the Stars' core contributors from last season came through for Texas in their first preseason game as Justin Dowling, Taylor Vause, and Mike Hedden figured into the scoring in a 3-2 overtime win. Hedden's extra-time goal was the ultimate game winner in a come-from-behind victory for the Stars. "It's always nice to come back in the third. 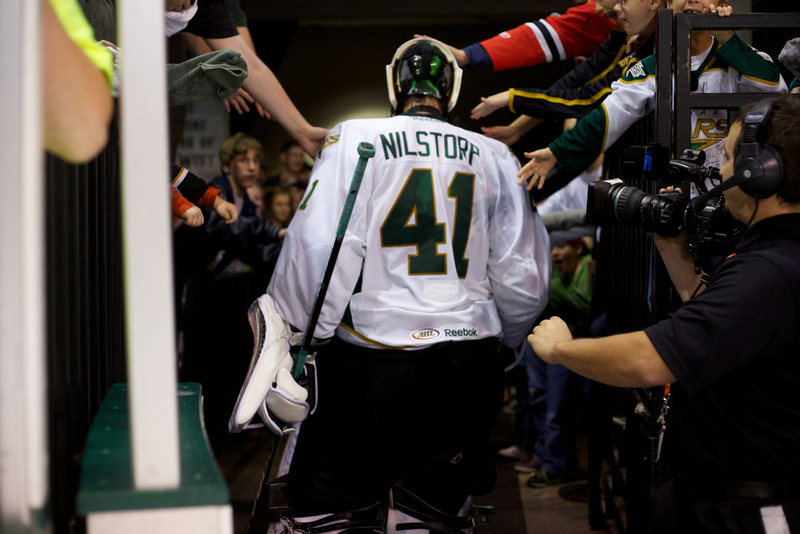 It doesn't matter when you're playing," said Coach Desjardins. "We want to be able to play good third periods." That come-from-behind effort shows resilience and perseverance early in the season. 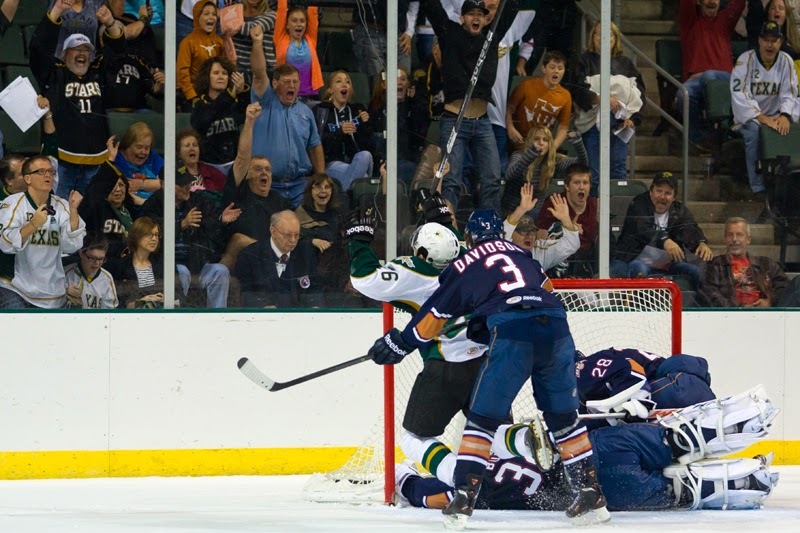 Taylor Peters and Taylor Vause scored the Stars other two goals. Jack Campbell played the entire evening and stopped 26 of 28. Oklahoma City drew first blood off the stick of Joel Broda, scoring glove side on a wrister of the right post. 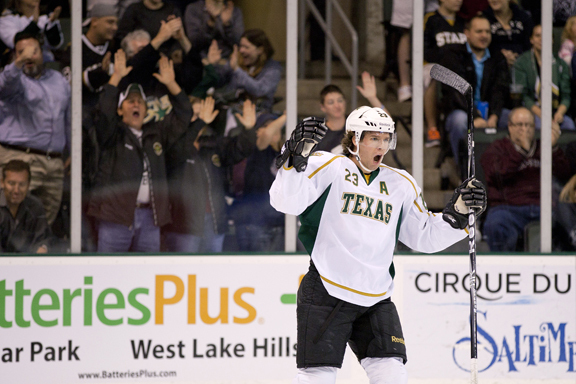 Texas evened things up in the second period with Taylor Peters' first goal as a pro. The goal went in over the blocker of Olivier Roy and was assisted by Spencer Bennett and Anthony Nigro. 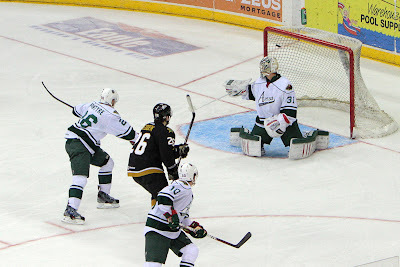 The Barons regained their lead with the extra man on a delayed penalty as Martin Gernat rocketed a slapshot to the net, which went in off a deflection. Texas rallied in the third with a beautiful play by Justin Dowling that was finished off by Taylor Vause. Mike Hedden boxed out the defender at the net and Dowling's backhand spin pass found Vause unguarded with six minutes left in the third period. "I was at the end of a shift there," said Vause. "I had contemplated changing but I had a pretty good feeling I was wide open on the back door. With Justin Dowling and his passes and skill level, you are bound to expect one of those once and game and I was lucky to put it in." Vause is on a tryout to Texas and looking to make the team again. 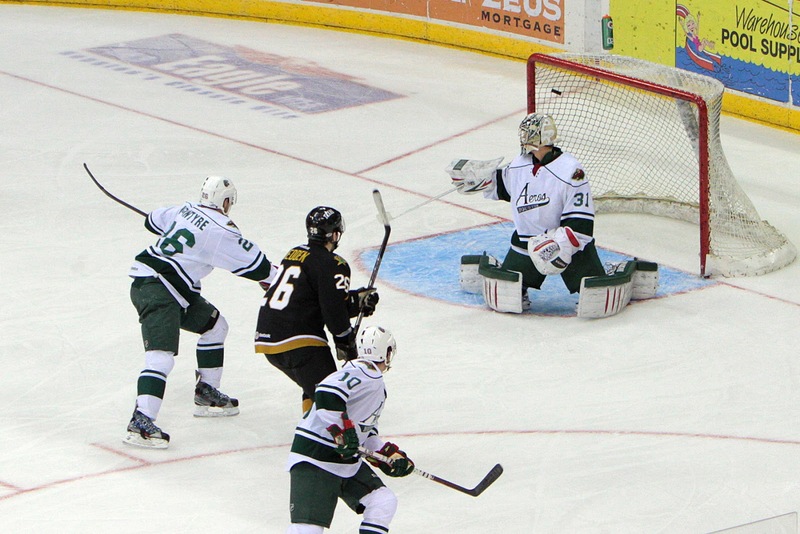 "It was nice for Vause to get a few there at the end," added Desjardins. "It was good for him. Lots of guys are in the spot where they need good camps." 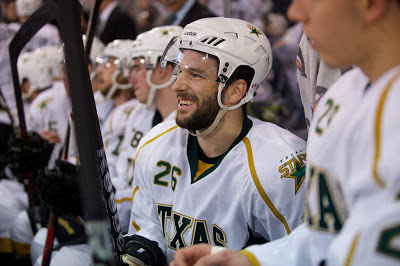 Texas went to the overtime period on the power play courtesy of C.J. Stretch. Mike Hedden polished off the scoring less than a minute into OT, assisted by Vause and William Wrenn, scoring a rebound goal. Hedden and Dowling wore "A"s; Francis Wathier wore the "C". 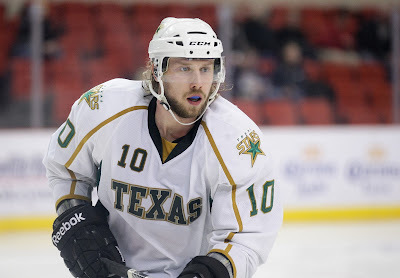 Justin Dowling is a big part of the core returning player group for the Texas Stars this season. He got a chance to head to Dallas Stars training camp this preseason and is looking to improve on his performance from last year when he collected sixteen goals and fourteen points in 38 AHL games. I got a chance to chat with him after practice on Wednesday. Calgary was affected by massive flooding in the summer. Was your family impacted at all? "We were just on voluntary evacuation for a few days. We were up on a hill, so everything was safe." "It was good and a lot of fun. 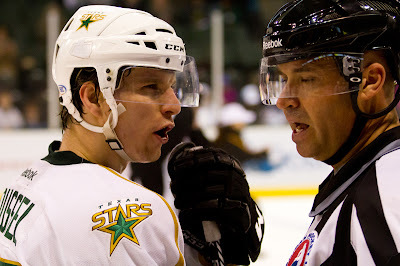 It is good to see where you stand up against the NHL guys like Jamie Benn and Ray Whitney. It's good to see where you need to improve." "I want to make sure I have a good start to the season. I want to work on some little things like the defensive zone and tweaking a few things here and there. I want to work on having a harder shot with [Doug Lidster]. I just want to get off to a good start." "It doesn't matter who is the third player. We have so many good players here and coming from Dallas still. There isn't a guy who wouldn't fit with all the talent in Dallas." "We didn't do too much with Ritchie in Dallas but we expect a lot from him. 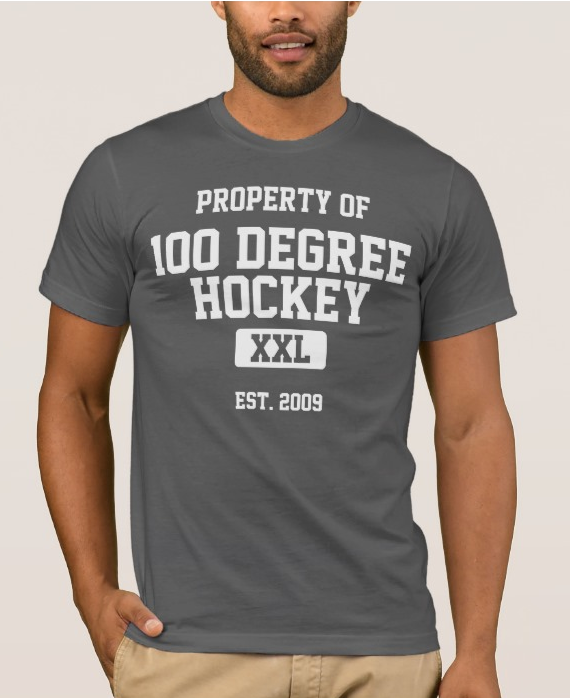 He's a big body and a great hockey player. If he plays [on our line], we are going to do our best to make him the best player he can be on the ice." 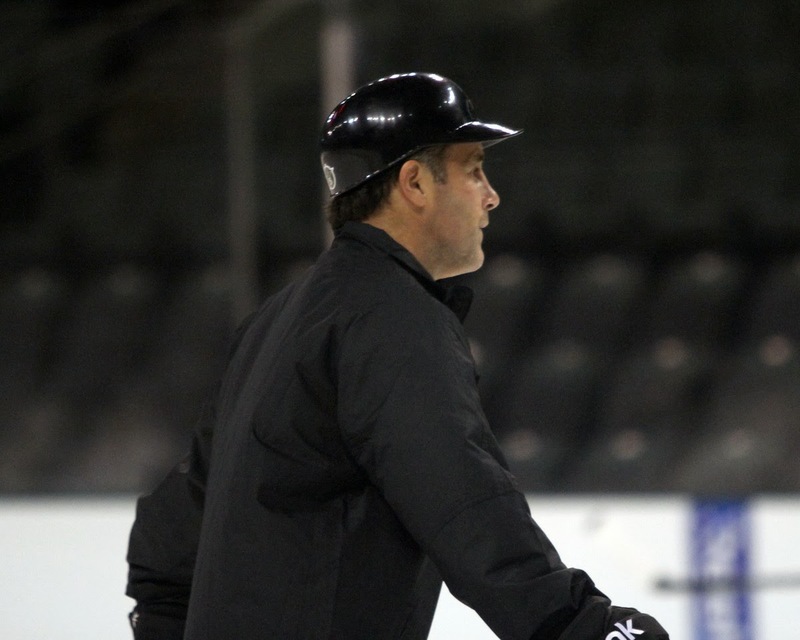 "Brad called me once a month or so [after the callup] just to check in and see how I was doing. Ralph and I had a great relationship, and it was always great when he would call me to see how I was doing. We just talked about life in general, not necessarily about hockey all the time. I always appreciated those calls." "He's said that he likes me as a player and he knows that somewhere along the line I'll get an opportunity so I should keep plugging away. Don't let my head get down or too down on myself. Stay positive. He was a great player back in the day and he knows what he's talking about." Texas Stars camp continues today with practice at 9:30 AM. After Friday's preseason game in San Antonio, there were a few quick minutes before the team boarded the plane to chat with fifth-year forward Colton Sceviour. 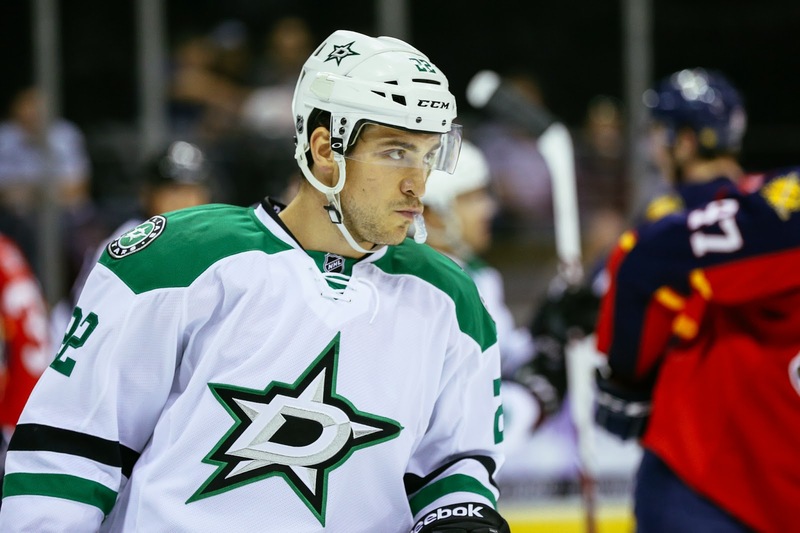 Sceviour is back with the Dallas organization on another one year contract and looking to make an impression and crack the NHL lineup for the Stars. He had just scored a power play goal in the game and survived this weekend's first big round of cuts, playing in the Saturday night game as well. "I felt good. It took a while in the first period to get our legs under us, I think. Once we started going in the first, the second and third everyone looked good and was skating well." "Tonight you definitely got to see some of the younger guys that are expected to be assigned to Texas. They're learning more about each other and working on the power play together. That's definitely bodes well and gives confidence that they can jump right into the regular season." "If you look at it, you can see they started in the past to rebuild it and they have a great guy like Jamie Benn to build it around, the trade for Tyler Seguin and the pickup of Valeri Nichushkin, who's a really great player at just 18 years old. With these guys coming up, you can definitely see the foundation of what they're going to build around. It looks like it's going to be an exciting and powerful team once these guys get to play together. It looks like it's going to be a good organization for years to come." "He absolutely deserves it. He made that team as a twenty-year old and has been a really good player for them. He's done everything they've asked of him. When he came down to Austin, he didn't have to do that; he was asked. He came down and didn't just go through the motions. He came down and carried us that playoffs and was one of the main reasons that we did what we did that year. 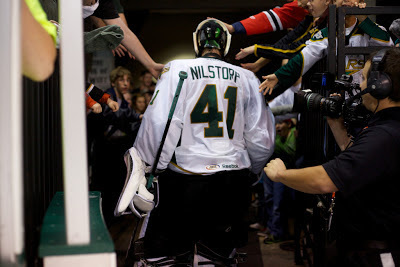 A guy like that has the attitude you want in a leader, a guy that works hard on and off the ice. He's definitely not the most vocal guy, but you'll watch him on the ice and see what he does and you'll want to match that." 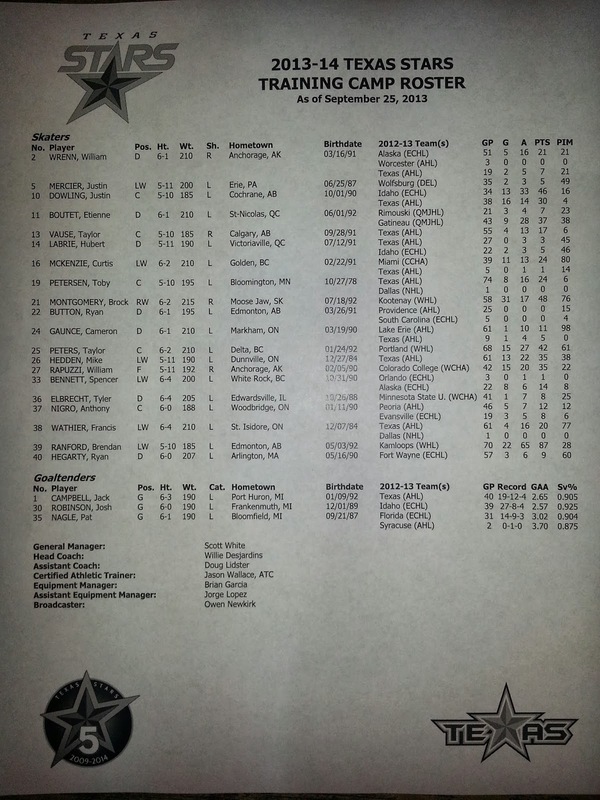 Before last night's 3-2 OT loss to St. Louis, the Dallas Stars reduced their training camp roster by ten overall. 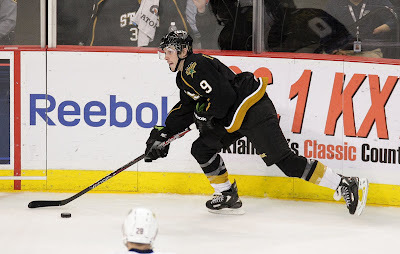 Nine of those ten will be in Cedar Park this week for training camp with the Texas Stars. 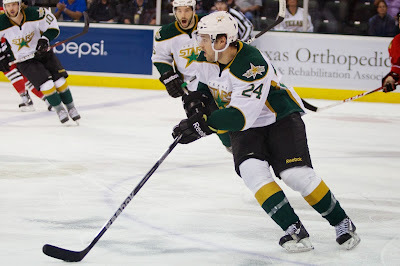 Further, Dallas placed Francis Wathier and Toby Petersen on waivers. They cleared this morning and were assigned to Texas this afternoon. Those on Dallas contracts assigned yesterday were forwards Curtis McKenzie and Taylor Peters and defensemen Ryan Button and Hubert Labrie. Five players were also released from their tryout contracts, all bound for the Texas Stars or Idaho this season. 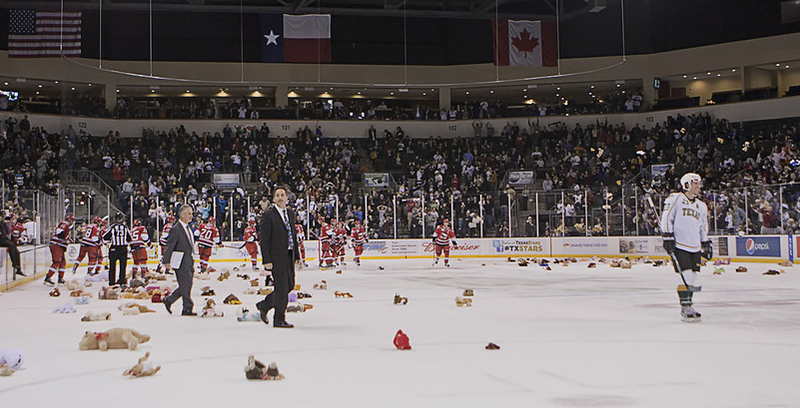 Those players were Justin Dowling, Mike Hedden, Brock Montgomery, Etienne Boutet and Brendan Ranford. None of those on tryout contracts had figured into any of Dallas's preseason games. It was a bit of a hidden note, but the Texas Stars announced their training camp start dates. Players are expected to report Tuesday with on-ice activities beginning on Wednesday. The full roster for the Stars will be released tomorrow. It should include many familiar faces from the Idaho Steelheads, including Taylor Vause and Carl Sneep. The Texas Stars announced their promotional calendar late in the day today. The calendar features a lot of familiar events, such as Teddy Bear Toss, Family Four Packs, and Winning Wednesdays. Players getting the bobblehead treatment this year include Travis Morin, Colton Sceviour and Toby Petersen. The Texas Stars, proud American Hockey League affiliate of the Dallas Stars, announced today their complete promotional schedule for the 2013-14 season. The team also announced that individual game tickets for the 2013-14 season will go on sale on Monday, September 16th at 10:00 a.m. This season's Stars promotional calendar is jam-packed with giveaways, popular fan specials and numerous theme nights, starting with a fifth season commemorative hat on Opening Night. The mini-bobblehead giveaways are back, beginning with the Travis Morin mini-bobblehead giveaway on January 11th against the newest AHL team, the Utica Comets. The Colton Sceviour mini-bobblehead night is on February 1st against the Toronto Marlies and the Toby Petersen mini-bobblehead night will be on April 4th as the Stars host the Lake Erie Monsters.